Born in Gardena, California in 1926, Robert Earle Wood was one of the main practitioners of the “California Style” of painting and is known for his watercolor landscapes and marine paintings created in a semi-abstract approach. Wood earned a B.A. from Pomona College and an MFA from Claremont College where he studied with American Scene painters, Millard Sheets, Phil Dike, and Jean Ames. He was elected a full National Academician, bestowing him the accolades of noting “N.A.” after his name. Just after World War II, Robert E. Wood began seriously studying watercolor painting at Pomona College. By the late 1940s, he was enrolled in the Claremont Graduate School while at the same time exhibiting his watercolors in museum and gallery venues. His work from this period often portrays regional scenes from the Claremont area and harbor subjects near Corona del Mar and Newport Beach. 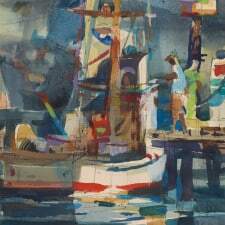 By the early 1960s, Wood was acknowledged as one of the premier California watercolorists to emerge during the postwar era. While most of his paintings were created with transparent watercolors, he also freely incorporated opaque colors or other complimentary mediums if he felt they enhanced the intent of his work. His paintings often balance areas of pure abstraction with stylized, although recognizable subject matter. Throughout his career, Wood divided his time between painting outdoors, en plein air, and working inside his studio. Wood also established a career in teaching watercolor painting, and taught at the University of Minnesota, Otis Art Institute, Scripps College, and the Brandt-Dike Summer School of Painting. Beginning in 1961, he held the position of Director of the Robert E. Wood School of Painting in Green Valley Lake, located in Southern California’s San Bernardino Mountains. In 1990, he completed 22 large-scale murals for the Hotel Caminoreal in Puerto Vallarta, Mexico. His book, Watercolor Workshop, was published by Watson-Guptill in the early 1970s and has been reprinted three times. Wood also taught watercolor workshops in Russia, Sweden, France, Japan, Tahiti, Jamaica, and Ireland. In New York, Wood exhibited his paintings at the National Academy of Design and in various commercial art galleries, and was an active member of the American Watercolor Society where he served as vice-president. 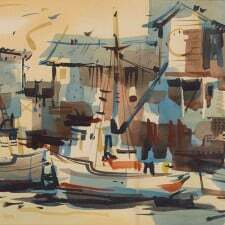 On the West Coast, he exhibited regularly with the California Water Color Society, West Coast Watercolor Society. Through his career, Robert E. Wood held more than 80 solo exhibitions. Sources Include: Gordon T. McClelland and Jay T. Last, "California Watercolors 1850-1970"; Interview with Robert E. Wood, 1984.